Esophageal atresia repair, also known as tracheoesophageal fistula or TEF repair, is a surgical procedure performed to correct congenital defects of the esophagus (the muscular tube that connects the mouth to the stomach) and the trachea (the windpipe that carries air into the lungs). Esophageal atresia (EA) and tracheoesophageal fistula (TEF) are commonly found together (EA/TEF), but may also occur separately. As of 2003, there is no known cause for these congenital defects. In children born with EA, the esophagus has not developed as a continuous passage into the stomach but ends in a blind pouch. In the majority of cases (86%) it is also abnormally connected to the trachea by a small channel called a fistula. EA/TEF repair is performed to correct these defects, ensuring the survival of affected infants and their proper breathing and digestion. EA/TEF is reported to occur in about 1: 4500 births. It occurs equally among male and female infants and has been associated with prematurity. There are no other notable associations. formed, leaving a fistula between the two normally separate organs. 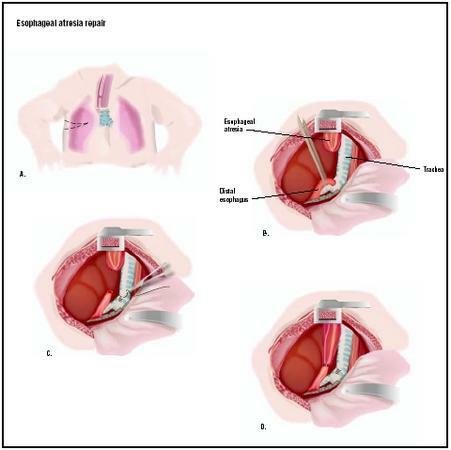 The combined defect is found in 86% of children who need esophageal atresia repair. Isolated esophageal atresia, or esophageal atresia without TEF, is a much less common congenital defect thought to occur later in fetal development and requiring a more complicated operation. The presence of TEF without EA occurs also, but with fewer noticeable symptoms in the infant, making it more difficult to diagnose. It may not be diagnosed until months or even years later when digestive disturbances occur. Surgery is required to correct all of these congenital defects. Type A: Esophageal atresia (7.7% of cases). EA alone is a condition in which both segments of the esophagus, upper and lower, end in blind pouches with neither segment attached to the trachea. Type B: Esophageal atresia with tracheoesophageal fistula (86.5%). This is the most common type of EA/TEF, in which the upper portion of the esophagus ends in a blind pouch and the lower segment of the esophagus is attached to the trachea by a fistula. Type C: Esophageal atresia with tracheoesophageal fistula (0.8%). Type C is a rare form of EA/TEF in which the upper segment of the esophagus forms a channel to the trachea (TEF) and the lower segment of the esophagus ends in a blind pouch (EA). Type D: Esophageal atresia with tracheoesophageal fistula (0.7%). Type D is the rarest form of EA/TEF, in which both segments of the esophagus are attached to the trachea. Type H: Tracheoesophageal fistula (4.2%). TEF alone is a condition in which a fistula is present between the esophagus and the trachea, while the esophagus has a normal connection to the stomach. The incomplete esophagus in EA/TEF will not allow swallowed saliva, food, or liquids to pass into the stomach for normal digestion and nutrition. Because of the defect, normal eating or drinking can be dangerous because food and fluids have a direct route through the fistula into the lungs. Swallowed material in the dead-end esophagus as well as stomach fluids may be aspirated into the lungs through the fistula, compromising the child's breathing and potentially causing pneumonia or infection. The impossibility of normal eating, breathing, and digestion creates a life-threatening condition that requires immediate surgery. The first signs of EA/TEF in a newborn infant may be tiny white frothy bubbles of mucus in the infant's mouth and sometimes in the nose as well. These bubbles reappear when they are suctioned away. Although the infant can swallow normally, the parents can often hear a rattling sound in the chest along with coughing and choking, especially when the baby is trying to nurse. Depending on the severity of the defect, some infants may develop a bluish complexion (cyanosis), caused by a lack of sufficient oxygen in the circulatory system. The infant's abdomen may be distended (swollen and firm) because the abnormally formed trachea will allow air to build up in the stomach and fill the space surrounding the abdominal organs. Saliva and stomach fluids may be aspirated into the lungs through the abnormal opening in the infant's trachea. Aspiration can lead to infection or even asphyxiation (impaired breathing or loss of consciousness due to lack of oxygen). The multiple anomalies that can occur with EA/TEF have been described by an acronym, VATER or VACTRRL. This acronym stands for v ertebral defect, a norectal malformation, c ardiac defect, t racheoesophageal fistula, r enal anomaly, r adial dysplasia, and l imb defects. About 10% of children with EA have what is called the VATER syndrome. More infants with Type A esophageal atresia have multiple anomalies than those with Type B, the combined EA/TEF. Healthy infants who have no complications, such as heart or lung problems or other types of intestinal malformations, can usually have esophageal surgery within the first 24 hours of life. The operation will be delayed for low birth weight infants or those with complicated malformations, usually until their nutritional status can be improved and other problems resolved sufficiently to reduce the risks of surgery. H-type TEF, which has fewer symptoms and is typically diagnosed when the child is at least four months old, is also easier to repair when the child's size and weight have increased. The esophagus can be dilated periodically during the growth period and a stomach tube used to decompress the stomach until the surgical repair is performed. All infants with some type of esophageal atresia will require surgery; many will have the repair performed in separate stages over a period of years. The procedures used to treat the five types of EA/TEF defects are similar. Surgery is conducted while the infant is under general anesthesia, unconscious and free of pain. The surgeon makes an incision in the right chest wall between the ribs. If the gap between the two portions of the esophagus is short, the surgeon may join both ends of the esophagus together. This is called an anastomosis. If the upper portion of the esophagus is short and a long gap exists between the upper and lower portions, reconstructive surgery cannot be performed and the infant will have to be fed in another way to allow several months of growth. In this case, a gastrostomy (stomach tube) may be surgically placed directly into the stomach for feeding. In the most typical EA/TEF repair, the fistula will first be closed off, creating a separate airway. Then the blind esophageal pouch will be opened and connected to the other portion of the esophagus, creating a normal pathway directly into the stomach. A tentative diagnosis of EA/TEF may be made before the child is born. One of the first signs of esophageal atresia may be seen during the mother's prenatal ultrasound examination. Polyhydramnios, which is an excessive amount of amniotic fluid surrounding the fetus, is not always diagnostic but offers a warning sign. Fluid is normally exchanged between the fetus and the amniotic fluid through swallowing, urination, and discharges from the nose and mouth. In EA/TEF, the fetus may drool excessively because of a collection of fluid in the abnormal esophageal pouch, thus increasing the amount of amniotic fluid. A newborn infant suspected of EA/TEF will be given an x-ray examination. The imaging study may reveal a dilated esophageal pouch that is larger than expected because it has collected a pool of amniotic fluid. During fetal development, the enlarged esophagus may also have pressed on and narrowed the trachea, a condition that may contribute to fistula development. Air in the stomach may confirm the presence of a fistula while gas in the large intestine will rule out duodenal atresia. The physician will also perform a comprehensive physical examination , looking for other congenital anomalies that are known to accompany EA/TEF. Chest x-rays may be taken to look for skeletal and cardiac abnormalities. Abdominal X-rays may be taken as well to look for intestinal obstruction and abnormalities. An echocardiogram (ECG) may be performed to evaluate heart function and an ultrasound of the kidneys performed to evaluate kidney function. A nasogastric (NG) tube may be placed in the infant; it may help to confirm a diagnosis of EA/TEF if it stops short of the usual distance (17 cm or about 6.7 in) to the stomach. When an infant is suspected of having EA/TEF, he or she will be transferred from the regular nursery to the neonatal (newborn) or pediatric intensive care department of the medical facility. Corrective surgery must be scheduled immediately to help ensure survival and promote proper swallowing, digestion, nutrition, and breathing. In patients with pneumonia or other lung problems, the doctor may clean out the baby's stomach and esophageal pouch with a suction tube to prevent the baby's stomach contents from being drawn through the fistula and into the trachea. A tube will be placed through the baby's mouth to continuously suction the esophageal pouch during surgery. The baby will be given fluids intravenously during surgery. Oxygen therapy will be administered if needed. An airway will be placed in the trachea if the baby has lung problems. Antibiotics may be given to treat or to prevent infection in the lungs, especially if the stomach contents have been drawn into the lungs. Preoperative blood and urine tests will also be performed. Immediately after surgery, the patient will be cared for in the neonatal ICU with monitoring of breathing, body temperature, and heart and kidney function. Oxygen may be administered, and a mechanical respirator may also be necessary. Pain medication will be given if needed. Blood and urine tests may be performed to evaluate the infant's overall condition. Scans may be performed to evaluate esophageal functioning. The infant will be fed intravenously or will have a gastrostomy tube placed directly into the stomach until oral feedings can be swallowed and digested. Secretions may be suctioned from the throat and a nasogastric tube may be placed in the infant's nose to clear the stomach as needed. Hospitalization may be required for two weeks or longer, depending on the presence of complications or other underlying conditions. An x-ray procedure known as esophagography is usually performed at two months, six months, and one year of age to monitor the digestive function as the child grows. Long-term follow-up of patients who have had EA/TEF repair is essential. There is some risk of postoperative breathing difficulties or respiratory complications, particularly infection or pneumonia due to aspiration of stomach contents. Pretreatment with antibiotics helps to prevent infection to some degree. Other risks of esophageal atresia repair include those that may occur with any surgery: reactions to anesthesia or medications; bleeding or clot formation; narrowing of the repaired organs; nerve injury; fluid imbalances; and collapsed lung (pneumothorax). Esophageal dysmotility. Dysmotility refers to weakness of the muscular walls of the esophagus. Some degree of dysmotility is expected to occur in all infants undergoing esophageal repair. This complication requires special precautions when the child is eating or drinking. About 50% of patients will develop gastroesophageal reflux disease (GERD) later in childhood or adult life. GERD is a condition in which the acid contents of the stomach flow back into the esophagus. The condition requires medical or surgical treatment. Recurrence of TEF. Recurrence is treated with repeat surgery. Swallowing difficulties (dysphagia). Dysphagia can cause food or pills to become stuck in the esophagus at the site of the surgical repair. Medications should be taken with water to prevent ulcers from developing. Breathing difficulties and choking. These complications are related to the slow passage of food, food stuck in the esophagus, or aspiration of food into the trachea. Chronic cough. The cough is characteristic of TEF repair; it is caused by weakness in the trachea and does not indicate a cold or illness. Increased susceptibility to colds, respiratory infections, and pneumonia. Precautions should be taken to avoid contact with other sick children. Parents and caregivers can seek advice about strengthening the child's immune system through appropriate nutrition and supplements. EA/TEF can usually be corrected with surgery, allowing the child to eat, breathe, and digest food in a normal fashion. Although almost 100% of children who have corrective surgery for EA/TEF survive the procedure, they may continue to have complications, some of which can be chronic. Ongoing medical care and additional surgery may be necessary. The post-operative mortality rate in healthy infants is essentially zero. Prior to the development of a more advanced EA/TEF repair technique in 1939, the condition was often fatal. Pre- and postoperative neonatal care has also significantly improved the surgical outcome. Infants with multiple anomalies or cardiac or pulmonary problems are more subject to complications than otherwise healthy infants. Esophageal atresia and tracheoesophageal fistula are congenital defects for which there are no recommended alternatives. These defects are commonly corrected surgically. There are no known measures to prevent these congenital defects. Allan, W., MD, et al. Pediatric Gastrointestinal Disease: Pathophysiology, Diagnosis, Management , 3rd ed. Boston, MA: B.C. Decker, 2000. EA/TEF Child and Family Support Connection. 111 West Jackson Blvd., Suite 1145, Chicago, IL 60604. (312) 987-9085. http://www.eatef.org . Allesandro, M. P., MD. Esophageal Atresia and Tracheoesophageal Fistula (EA/TEF) . Gastrointestinal Diseases, Virtual Children's Hospital Library. http://www.vh.org/pediatric/provider/radiology/PAP/GIDiseases/EATEF.html . TEF/VATER International. What is esophageal atresia? http://www.tefvater.org . EA/TEF repair is performed in a hospital operating room by a pediatric or general surgeon. Is surgery the only solution? When will surgery be performed and what will be the likely results? How many children have you treated with this procedure? What were the results? Will my child be able to breast feed or drink milk from a bottle? How soon after surgery? How soon can I take my child home? What symptoms should I watch for and what kind of problems may occur when we get home? How will my child's early years be affected by this condition and the repair surgery? Will my child enjoy normal eating, growth, and social activities? What are the chances of my child needing another operation? My baby was born on 31.05.2008 in 02.45 and had a surgery because of esophageal atresia type b on 01.06.2008. The reparation was excellent, but know she has infection on the right lung. Tell me something about this problem. How long it will took to get over this and is this difficult situation. Please send me an answer. my baby was born on october 5, 2008 and had surgey because of esophageal atresia. after 3 days from he born doctor do operation to connected but he can't connected because of space/line from mouth to stomach more tahn 1 cm. than doctor do something, he put small pipe direct to his stomach. Now, my baby if he drink and eat used that small pipe.and doctor said aftar 1 year he'll do second operation to connecting the line from mouth to stomach. i want to know, there is negative effect after he connecting the line? and he can live normal without infection? thank you for your answer. Hi, I have had esophagael atresia w/tracheaesophagael fistual back in 1973 at CHOP. I had dilation at 6 mths, 2 yrs, and 6 yrs due to stricture. I am now 36 y. old with GERD--but take daily Prilosec to suppress the acid. Clearly avoid any large objects in respect to your baby--swallowing is still a problem. I also have loss of motility. My sisters third child was born with esophageal atresia w/ tracheaesophagael fistula and had the operation three months ago . he is now dealing with problems relating to ingestion of milk into his lung and the pneumonia associated with it. the problem is chronic , it is difficult to deal with this as she has had to spend a lot of time in hospitals , They have given her some physiotherapy techniques to help remove fluids from the lung , but it seems very little for a rather large problem. any techniques suggestions in lifestyle to help her avoid spending eh next year in hospital. MY SON IS HAVING A PROBLEM BY BIRTH OF TEF .3 TIMES ULTRASOUND WAS DONE OF MY WIFE BEFORE HIS BIRTH .CAN I CLAIM ON THE DOCTOR WHO WAS DOING TREATMENT OF MY WIFE ? AS IT COST VERY MUCH TO OPERATE IT AS I AM WORKING AS A WORKER IN PRIVATE COMPANY AND I CANT'T AFFORD IT SO PLS ADVICE ME FOR THAT. My husband had this surgery as an infant in Chicago, in 1959. He's 52 and beginning to experience problems with recurrent pneumonia due to food particles getting stuck in the pouch that was created. He tends to cough a lot at night. For those with infants facing this, have faith. He's 52, a father and successful. I was born in 1958 with TEF Type B. Surgery was conducted on me before I was even 24 hours old. The repair was a success but for 10 years I suffered with pneumonia; 18 times. Eventually at about 10 years old a doctor discovered that the the point where my esophagus was repaired the lower part was smaller than the top part thus leaving a ledge whereby food particles were trapped and when I slept these particles would get into my lungs and cause the pneumonia. I had my esophagus stretched so that both top and bottom were the same size. I never had pheumonia again. Today I am 53 and in pretty good health. Best wishes to you. I HAV A FREINDS DAUGHTER WHO HAS BEEN OPERATED AFTER A WEEK WHEN SHE WAS BORN.HER BIRTH WEIGHT WAS 2.8 KGS.SHE IS IN NEONATAL CARE.SHE WAS RESPONDING GOOD FOR 5 DAYS BUT AGAIN SHE HAS STARTED VOMITING.SHE HAS NOT BEEN YET STARTED WITH MOTHERS FEED.WHAT CAN BE THE REASON FOR HER DELAYED RECOVERY AND VOMITING. My Dad is 74 but wondered if anyone had some reassuring information. He had his hole in oesphagus repaired but there was still a leak. They thought it had repaired itself as the drain was empty. Then he had vomiting and there is small fluid in the drain. Does this mean maybe he has another tear in the oesphagus? I'm working with a 3 years old girl who was born with Tracheo-Oesophageal-Fistula (TOF) and Oesophageal Artresia. Has been having episodes of sickness since she was 'joined up' in April 2010. Sickness was about 4 weeks apart but are now 2-3 weeks in between and last about 3-4 days, where she wretches up saliva and bile and then sleeps. Is there somebody who could givew me some advise what could cause this problem or how to sort out? I'm really apprecite for your help. Just some encouraging words to parent of EA / TEF kids. I had type C, though back in the 50's there was very little distinction, and was operated on at 3 days old. Since then I have had a few minor issues prior to my fifth birthday but after that I have been very healthy with no further complications from the condition. I played sports, married, had children, and am now a grandfather. Have faith, your child will get past these hurdles and be a stronger person. Hello, i am from malta, i have a nine month old baby, but he was born premature , infact he weights 5.5kgs. I feed him through his tummy, i try to feed him from the mouth but he doesnt want to know! this is the third mont trying but to no avail! another problem that worries me is that he coughs after every botttle i feed him through the tummy! is it normal for them to cough and throw up mucus?? thanks! My daughter had a type B TEF repair done 22 years ago. Apart from being g tube fed till she was 2yrs, many bouts of pneumonia and a restricted diet, she had overcome most swallowing issues until just this past year. Our local surgeons has dilated her twice however our her original surgeon says most patients don't need dialations and this could cause more scarring. What to do now? I at times i cough and cough. Apparently it was sort of a rare type surgery the doctors performed but it has seemed to work successfully over the year for me. I can't really digest beef steak or pork as its way too heavy for my stomach to digest properly. I tend to eat fish, processed meats as its easier for me to swallow and digest. I use the bathroom normally. It's just simply amazing the technology doctors really had back in the 50's. I'm 54 now and still going strong. I do not smoke which is a good thing. My advice to everyone who ever had this surgery done. It's worth it. Believe me if i hadn't had this surgery i probably wouldn't be here today telling you this. God bless the doctors and nurses that made it all happen. In three days I will celebrate the 60th year of my surgery to fix my TEF and EA issues in NY Presbyterian Children's Hosptal. My case involved a total disconnect of the esophogaus and a blind pouch which forced any liquid or food intake directly to my lungs. After a few days from my birth the doctors discovered the condition and I was rushed to NY for the procedure. My informtion has it that I was one of the first to have a procedure that did not involve any intestinal grafting but instead a repositioning that permitted the reconnection of the two distal ends of my esophogaus and removal of the pouch. The procudre was written up in the New England Medical Journals. I do have to be carefull to take small bites of food as to not have them become stuck, on what I call the ledge in my throat, but other than tha I have not had any other bad affects. I thank God for all who helped me back in the day. 08/18/1971- New Orleans Charity Hospital. I was 3 days old when I was give 1/1000 chance to survive. I had Atresia w/prox. fistula. I have lots of memories of fingers down my throat, being snatched up by my feet, given "who knows what to drink " because that was all they had, never leaving my mothers side or being allowed to go places with others. However, I also know that it was all out of love & fear.I spent most of my childhood with chronic bronchitis and I can recall having pneumonia at least 5 times in my childhood. I have food lodge every time I eat. I dislike using the word choke because 99% of the time I can breath, which no one understands. I just have to wait for the food to work its way down or at times back up. Embarrassment in public places when I fear others realize that I am having difficulty when swallowing. Most people never realize that I am struggling even some of my closest friends. But the fear is still there. So that's my story. I am curious if anyone has had in problems later in life? with inflammation? scar tissue? thank you in advance. I was born in 1959 in Ottawa Canada, with Esophageal atresia. I believe it was after four days they discovered the birth defect,as milk would not stay down. They took a section of my large bowel and attached it to my esophagus, after a good number of throat stretching procedures done, I turned out ok. Just have to take my time when eating, which is not a bad idea anyway! I thank God and the Drs for the wonderful life that I've had. I was born with this condition June 1961, in Brisbane Australia. It was kept a secret because I was adopted at birth & my adopted parents paid for the operation.